THE DATES ARE JUNE 25-29 FOR SPANISH; AND IN ENGLISH THE DATES ARE JULY 9-13. WHETHER YOU'RE THE TYPE TO ROOT FROM THE STANDS, MARCH IN THE BAND, CHEER ON THE FIELD, OR HUSTLE TO THE LINE, THE TIME IS NOW - IT'S GAME ON! 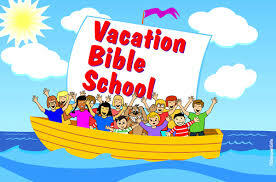 JOIN US THE WEEK OF JULY 9-13 FOR VBS.